BALTIMORE, MD—Oriole Park at Camden Yards has housed the Baltimore Orioles since its unveiling in 1992 and continues to be a favorite among baseball enthusiasts. The park recently benefited from the installation of a brand new distributed sound reinforcement system, featuring nearly 300 loudspeakers from EAW. 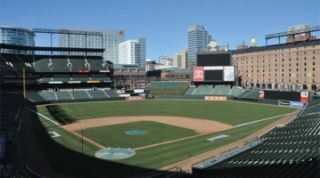 The installation, completed in time for the Orioles' season opener against the New York Yankees, was finished in just six months, which is approximately half the amount of time a system of this magnitude would take to install under normal conditions. The Maryland Stadium Authority, who manages the state-owned facility, contracted with the Tampa-based AV integration company AVI-SPL. The system was designed by New York-based SIA Acoustics, which was the audio consultant for the Baltimore Orioles on the project. Working with EAW to complete the Oriole Park installation made the process easy for us," stated Sam Berkow of SIA Acoustics. "EAW and our contracting team, SPL, worked out an initial schedule for delivery, in order to meet a tough installation timetable, and they met every deadline with products we could rely on right out of the box." Oriole Park at Camden Yards recently received a brand new distributed sound reinforcement system featuring nearly 300 loudspeakers from EAW. rear-fill, lower deck rear-fill and outfield front-firing; and EAW JFX100i compact full-range loudspeakers for club level front-firing and lower deck down-fill. The EAW UX8800 digital signal processor was employed for bowl loudspeaker processing. The system also boasts a new BSS Audio processing, 110 Crown Audio amps, and a 48-channel Yamaha digital mixing console. A digital audio network is utilized for signal distribution throughout the stadium, minimizing signal loss and improving reliability and control. Remote monitoring and control of every amplifier channel is also provided. "Oriole Park is one of the finest stadiums in baseball—one of the first modern stadiums to celebrate the traditions of baseball," Berkow enthused. "It now has one of the finest sound systems in baseball to match. EAW products serve the seating bowl well and provide the stadium with high performance audio." Will Parry, vice president of sales for AVI-SPL explained, "Eighteen years ago the team at legacy SPL installed the original system at Oriole Park at Camden Yards. At that time it was one of the first distributed sound systems in professional sports and radically changed forever the way Major League stadiums were designed and heard. As a resident of Maryland and as part of the original team, I was extremely proud to have been involved in that project. The upgraded audio system that SIA Acoustics designed and AVI-SPL installed certainly reaffirms Oriole Park as a world-class ballpark. EAW speakers made our job easy, as they just sound great!" Jeffrey Cox, vice president of EAW, concluded, "We were very proud to have been chosen as the loudspeaker system manufacturer for the newly remodeled Oriole Park at Camden Yards. This is one of the iconic baseball stadiums in Major League Baseball, and despite the very tight delivery schedule, EAW was able to provide the entire system on time. Working with Sam at SIA and SPL is always a pleasure and their design was impeccable, delivering excellent coverage throughout the stadium. Oriole fans will be delighted with their new sound system. Play ball!"